Elizabeth Blackwell's "A Curious Herbal" (1751): 1. It grows 2 or 3 foot high; ye leaves are a grass green, and the Flowers a find Crimson. 2. It is cultivated in Gardens, and flowers in April and May. 3. This Plant generally supplies the place of ye male Piony, and is accounted good for the Epilepsy, Apoplexy, and all kinds of Convulsions and nervous affections, both in young and old. Some recommend it in histeric cases, the obstructions of ye menses, and ye retention of the Lochia. The root and seed are hung about children's necks to prevent convulsions in breeding their teeth. The ordinary Female Peony hath as many stalks, and more leaves on them than the Male; the leaves not so large, but nicked on the edges, some with great and deep, others with small cuts and divisions, of a dead green colour. The flowers are of a strong heady scent, usually smaller, and of a more purple colour than the Male, with yellow thrums about the head, as the Male hath. The seed vessels are like horns, as in the Male, but smaller, the seed is black, but less shining. The root consists of many short tuberous clogs, fastened at the end of long strings, and all from the heads of the roots, which is thick and short, and of the like scent with the Male. Place and Time: They grow in gardens, and flower usually about May. Government and virtues: It is an herb of the Sun, and under the Lion. Physicians say, Male Peony roots are best; but Dr. Reason told me Male Peony was best for men, and Female Peony for women, and he desires to be judged by his brother Dr. Experience. The roots are held to be of more virtue than the seed; next the flowers; and, last of all, the leaves. 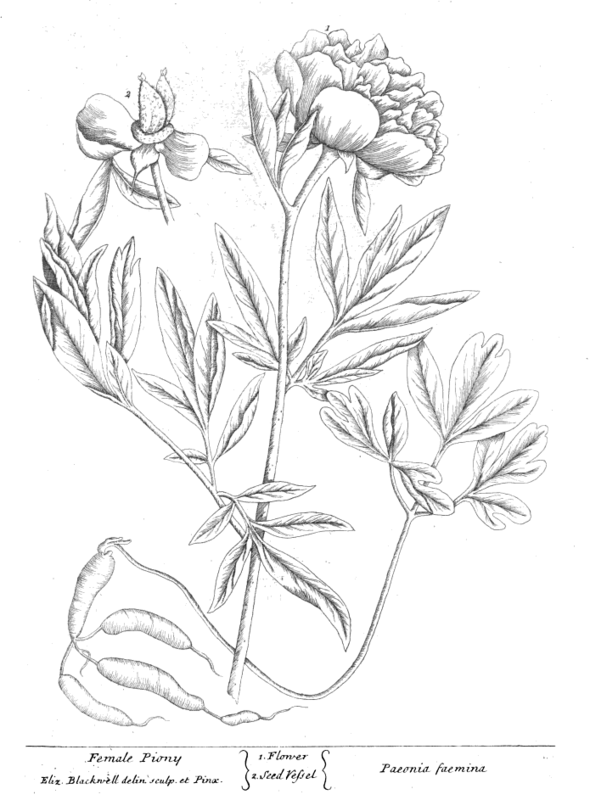 The roots of the Male Peony, fresh gathered, having been found by experience to cure the falling sickness; but the surest way is, besides hanging it about the neck, by which children have been cured, to take the root of the Male Peony washed clean, and stamped somewhat small, and laid to infuse in sack for 24 hours at the least, afterwards strain it, and take it first and last, morning and evening, a good draught for sundry days together, before and after a full moon: and this will also cure old persons, if the disease be not grown too old, and past cure, especially if there be a due and orderly preparation of the body with posset-drink made of Betony, etc. The root is also effectual for women that are not sufficiently cleansed after child-birth, and such as are troubled with the mother; for which likewise the black seed beaten to powder, and given in wine, is also available. The black seed also taken before bed-time, and in the morning, is very effectual for such as in their sleep are troubled with the disease called Ephialtes, or Incubus, but we do commonly call it the Night-mare: a disease which melancholy persons are subject unto: It is also good against melancholy dreams. The distilled water or syrup made of the flowers, works the same effects that the root and seed do, although more weakly. The Females is often used for the purpose aforesaid, by reason the Male is so scarce a plant, that it is possessed by few, and those great lovers of rarities in this kind.